This master plan for the poly-centric City of Shanghai is a replicable node for a community of 5,000 people. Located adjacent to rural areas at the urban edge of the existing metropolis, the residential neighborhoods incorporate a series of public spaces to encourage walkable and interconnected civic life, laid out in accordance with Shanghai's historic lanes. The massing of the buildings steps down towards the river, opening the city up to the south to maximize the utility of natural resources like sun, wind, water and thermal mass. The building design combines traditional elements of climate responsive Chinese architecture with innovative technology, including a site-specific rooftop rainwater collection system. 1998 New Blood. 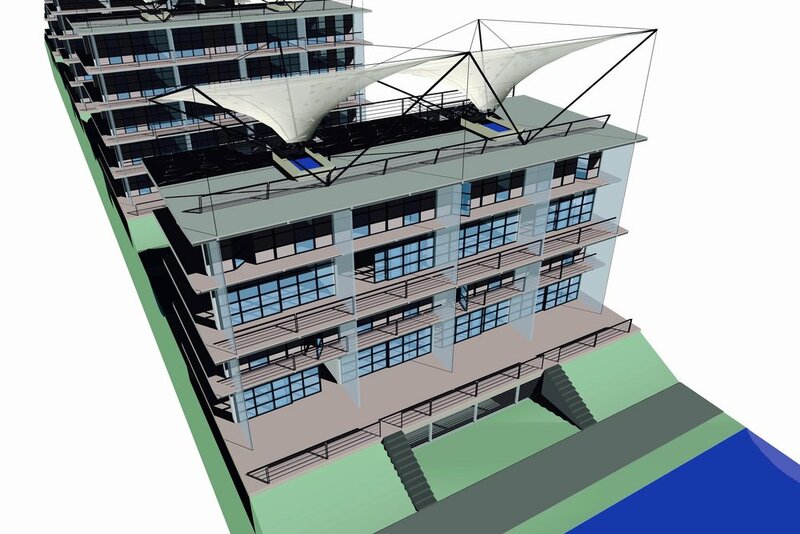 "Net Zero Energy Building and Urban Design Leadership in Germany and China." 1998 University of Southern California.“Studio Works: Shanghai 2000. Net Zero Energy Building and Urban Design”.